projects both large and small. Harry Caswell Plumbing Mechanical and Utility Contractor provides a full service solution in dewatering operations. The impact of groundwater on a construction project can be enormous. Unforeseen groundwater problems can cause major delays and often require drastic redesigns of the project itself. safe soil conditions in excavations below groundwater level. Dewatering is used in deep excavations that are required for lift stations, tunnels and other underground structures. Wellpoint systems are used to lower groundwater levels to provide stable working conditions in excavations. 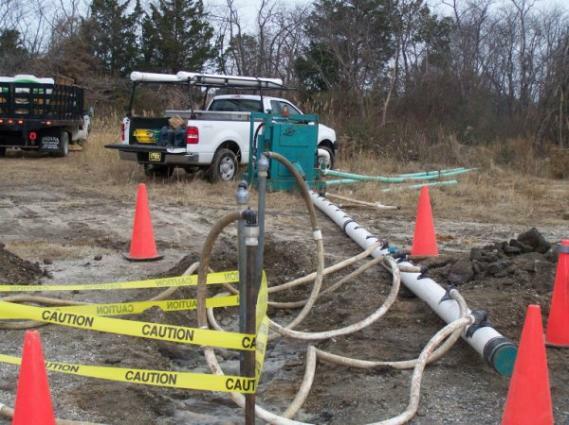 Wellpoint systems are particularly suited for shallow foundations, utility and trench work dewatering. A wellpoint system consists of a series of closely spaced small diameter shallow wells. improve the stability of silty fine sands and laminated silts and clays by controlling excess pore pressures. Supply pumps at ground level feed high-pressure water to the ejector nozzle and venturi located at the tip of the wells. The flow of water through the nozzle generates a vacuum in the well and draws in groundwater. stability. The system is reliable and the wide spacing of the wells reduces access restrictions to a minimum. We have over 20 years of experience dewatering in just about every way possible. From small to large, every dewatering project is handled with the same commitment to giving you superior service.